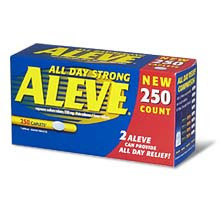 I've tried many kind of painkiller but like Aleve I'd never seen!! the amazing thing that it works like the magic and approximately within 5 minute after having the tablet you will stop feeling the pain! I was having bad pain in my wisdom tooth and tried many things in order to stop this ache!! but when I had Aleve and within a couple of minutes the aching disappeared, actually it does not solve any illness problem, but if you need something to kill your pain, I do extremely recommend it.